Miami-based Gian Recondo and Jean Rodriguez are brothers-in-law who were both starting their families and yearning for the additional security of a second business when they came across TapSnap. Jean is already in the entertainment business as a back-up singer for Marc Anthony, and a producer/songwriter with his own business Jeanius Musiq. “I’ve been doing music all my life. I work with a lot of different artists, writing for them and producing songs,” he says. Gian is a credit manager in the printing industry for a design company, who works mainly from his home office, and can set his own hours. The idea first came when Gian attended a wedding last year that had another photo booth company. “I called Jean the next day raving about it,” he says. When they looked into it, they learned about a new company called TapSnap that was creating the first national photo booth brand – without the booth. “We choose TapSnap over the competition mainly due to the business plan TapSnap presented to us. From the beginning we felt very comfortable working with everyone,” says Gian. Because their machine is like a robot, they named their machine Johnny Vice – Johnny from the robot movie Short Circuit in the eighties and because they are both called John, and Vice, because it’s Miami. 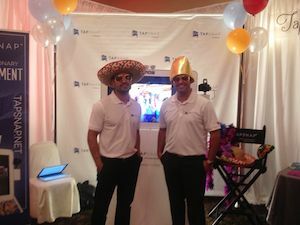 On June 5, they held their Johnny Vice unveiling party to introduce TapSnap to family and friends. “We had a big silk blanket over it, and then we unveiled TapSnap to everyone,” says Jean. That led to their first big event. One of their friends, a chef at Red, the Steakhouse, liked the machine and introduced them to the chain’s Marketing Director. Meanwhile, they took Johnny Vice to its first booking, the Wedding Salon Bridal Show at the Epic Hotel in downtown Miami on June 10. “We almost couldn’t handle the crowd. We nearly lost our voices and never had time to take a break. We had a line-up at our booth all-night long. TapSnap was an absolute hit,” says Gian.